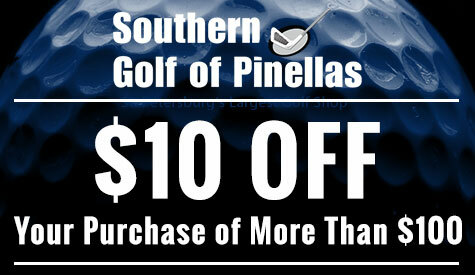 Southern Golf of Pinellas is where you tee off to an improved golf game. Hit more greens in regulation with brand-name equipment and clothing, as well as professional club repairs, at our golf store in St. Petersburg, Florida. When you purchase golf equipment or want golf lessons, you should only do so with experienced, trained professionals. Our staff is comprised of PGA® professionals with 38 years of combined experience to ensure you get what you need to dominate on the course! Stop by our individually owned golf store for everything you need to be at the top of the leaderboard. Request more information from us regarding our wide selection of golfing products and services. Monday – Friday: 9:30 a.m.–6:00 p.m.